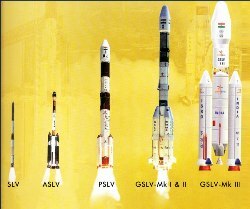 Geosynchronous Satellite Launch Vehicle(GSLV)-Mark I&II ,is capable of placing INSAT–II class of satellites (2000 – 2,500 kg) into Geosynchronous Transfer Orbit (GTO). GSLV is a three stage vehicle GSLV is 49 m tall, with 414 t lift off weight. It has a maximum diameter of 3.4 m at the payload fairing. The first flight of GSLV took place from SHAR on April 18, 2001 by launching 1540 kg GSAT-1. It was followed by six more launches , GSLV-D2 on May 8, 2003 (GSAT-2 1825 kg), GSLV-F01 on September 20, 2004 (EDUSAT 1950 kg), GSLV-F02 on July 10, 2006 (failed), GSLV-F04 on September 2, 2007 (INSAT-4CR 2130 kg), GSLV-D3 on April 15, 2010 (failed) and GSLV-F06 on December 25, 2010 (failed). Geosynchronous Satellite Launch Vehicle Mark III, is a launch vehicle currently under development by the Indian Space Research Organization. GSLV Mk III is conceived and designed to make ISRO fully self reliant in launching heavier communication satellites of INSAT-4 class, which weigh 4500 to 5000 kg. It would also enhance the capability of the country to be a competitive player in the multimillion dollar commercial launch market. The vehicle envisages multi-mission launch capability for GTO, LEO, Polar and intermediate circular orbits. The development work on Mk III is progressing as per schedule for a launch in 2012.